The Magnesium Mineral is one of the family of major minerals although it is not as well known as some of the other minerals in the same group. Even though it is not as prominent, the magnesium mineral plays an essential role in about three hundred biochemical processes that take place inside the body. As a rough guide, one half of the body's supply of the magnesium mineral can be found in the bones. The cells that make up the body's organs and other body tissues store the balance, except for the small amount that's found in the blood. Like calcium and phosphorus, magnesium is needed to properly develop and maintain the skeletal system. Specifically, magnesium is crucial to the body's ability to absorb calcium and it also helps regulate calcium levels. Where the heart is concerned, magnesium is just as important. It helps to regulate the heart's rhythm which reduces the risks of developing arrhythmias. Magnesium also helps to reduce blood pressure, greatly lowering the risks associated with heart disease. Studies centering on magnesium's ability to lower cholesterol levels are ongoing and show promising results. Magnesium plays a role in the metabolism of carbohydrates and it's believed to be involved in the way insulin is released and the way it behaves in general. Magnesium's role in diabetes is also being studied and it seems there is a link between diabetes and a magnesium deficiency. Magnesium helps keep the blood's pH levels in balance by controlling the amount of acid in the blood. Magnesium helps keep muscles relaxed and it also helps relax the mind. Muscle tension, anxiety and even headaches and migraines can all be kept under better control when the body has sufficient levels of magnesium. For adult men, the recommended daily requirement for magnesium is 350 mg/day. Women should get 280 mg/day. Pregnant women should increase their magnesium intake to 300 mg/day. Dark green vegetables such as spinach, kale, broccoli and avocado are excellent magnesium sources. Other magnesium sources include whole grains, legumes, black beans, brown rice, lentils, almonds, cashews, peanuts and peanut butter, bananas, soybeans, wheat bran and bran flakes, lean meats, dried figs, halibut, crab and sardines. There also is a significant amount of magnesium in hard tap water. By definition, hard water contains a lot of minerals. If you have hard water where you live, be sure to take advantage of this source! The first signs of a magnesium deficiency include nausea, vomiting, a loss of appetite, fatigue and a feeling of weakness. As the deficiency progresses, a person can develop an irregular heartbeat, heart spasms, changes in personality, tingling and numbness and muscle cramps. There may even a decrease of calcium and phosphorus in the blood. 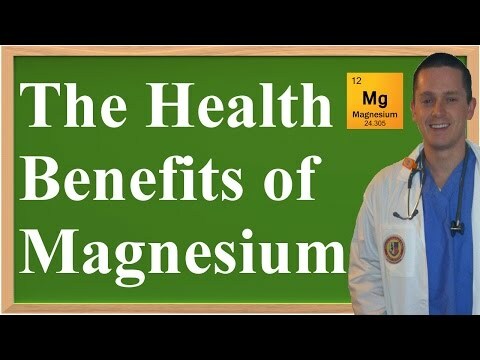 As mentioned above, magnesium deficiencies may also lead to heart disease, diabetes and osteoporosis.